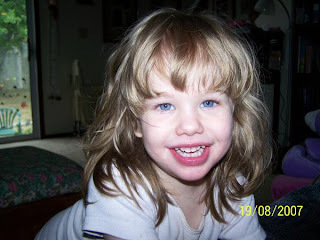 A site devoted to the life and world of Miss Abigail Marie Vejrosta. We took Abby to swim therapy this morning for the 1st time in over a month due to our vacation and then her therapist being off. It was at a different pool but she didn't seem to mind. The old one is getting a face lift. She was thrilled as she always is when she gets to see Heather and swim. From there we had to drive over to Kansas City Kansas to the Coalition for Independence. They sell used equipt for a very discounted price and we were able to get her a pediatric commode with padding and picked out a used kid kart stroller. They need to put new wheels on it and new foot rests and we are supposed to go back for it later. We were hoping for a foldable stoller but we will take what we can get! At least her feet wont get caught up in the wheels of this one. We were hoping they would have the communicator we have on our wish list but no such luck. After we left we had to race home, get her changed and fed. The bus was pulling up as we got out the door. I will blog later about her bday when I can get my head screwed on straight! We went to Abby's 4th birthday party at school and I am so freaken excited! Everyone was so cute and she was so happy we were there. We had cupcakes and milk and juice and Abby got to show off for us. The teacher brought out a switch and adaptive toys and Abby was actually able to play with them. Not just sit there and watch but she played with them. I couldn't keep the smile off my face and I just wanted to bawl. Her Daddy is going to be so upset he missed it. I wish I would have brought the camcorder! I absolutely can't describe the feeling of watching her play and interact with her friends. She's usually the one that just sits there eating her hands. It was amazing. She was so proud of herself. Here she is activating the bubble blower. She really clapped and squealed with this one. I want more now Mommy! Acticating the bubble machine. The other kids went nuts dancing around her and popping the bubbles! Hello all. It is still crazy here this week with family in and out. We got a progress report on Abby's IEP. I hate those things. It does say she is making progess on some things but says she is not demonstrating object permenance. Which means when they move or cover up an object she is playing with it she doesn't look for it. It also say she will only look at or for someone who is speaking that it directly in front of her and will hit null switches when choices are present. So I think that means that if there is something by itself she will hit the right switch but if there is more than one she will hit any switch. I wish we could afford to get her some of this stuff at home so I can work with her on it. I am going to request an observation so I can see for myself what she is doing or not doing and maybe give them some tips or know what to try with her at home. I am also going to take an IEP class DDS is offering in October so I can better know my rights and what we can and can't do and have for her. The picture is from the crown we bought for her birthday outfit. She wore it for hours and I just had to get a picture! Princess for the day at school. She looks thrilled!